When selecting the most suitable motor for dynamic applications, the effective torque is a crucial quantity. 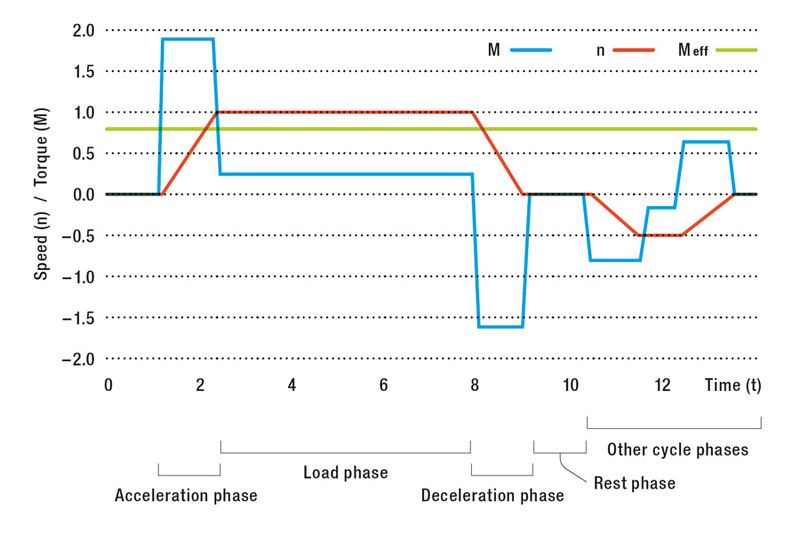 In many applications, a motor’s continuous output is limited by its thermal budget. 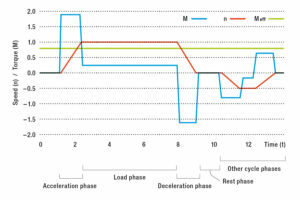 Optimum design is crucial to keep a motor from overheating in an application. The rated torque is usually used during design. However, that is based on a motor running in continuous operation at a clearly defined operating point with constant speed and constant torque. In this case, a state of thermal equilibrium will be reached after a certain period. But in many applications, especially in dynamic operation, the operating points change constantly. An example is a shuttle in a high-bay warehouse. As soon as it receives an order to retrieve stored goods, it accelerates from its starting point to the required speed. Then it moves at constant speed toward its destination and decelerates to come to a stop at the required position. Different torques are required for the acceleration, constant speed and deceleration phases. This example illustrates that for dynamic applications, more parameters need to be taken into account during design than for the simple case of continuous operation: torques for acceleration, constant speed and deceleration, and times at rest. The formula for effective torque shown above is an idealization of such cyclical operation. MA and tA represent the starting torque and the start-up time; staying with our example, the acceleration phase for the shuttle. ML and tL represent the load torque and the travel time to the destination, while MBr and tBr account for the deceleration phase. With tSt , the time at rest (without torque) is also accounted for. The formula can be expanded as needed depending on the actual cycle, making it possible to determine the corresponding effective torque for continuous operation. That allows an assessment of whether the selected motor is suitable for the application. The effective torque for the application has to be less than or equal to the rated torque of the selected motor. The effective torque is an aid in the selection of a suitable motor. In motor development, we use representative operating points (continuous operation) for the design and characteristics of the various motor sizes. They are based on empirical values from actual ­applications.